Various Social Engineering attacks are in the news these days. By taking advantage of people's vulnerabilities, criminals can get personal information or have programs run on their computers that can harvest information later, or be used as part of a botnet . A simple example is where the attacker sends email to a victim saying they have won a prize and that they should visit a web site and confirm their identity by providing sensitive data like their Social Security Number, date of birth or mother's maiden name. The attacker than uses this data for fraud while the victim awaits their prize. You might think this sort of attack is new, but here is a story of a social engineering attack from the early 1970s. Dartmouth College developed a time-sharing system in the 1960s and allowed wide scale usage of it in the community. There were lots of non-science related programs available to use, including word processing and early text games. All students, faculty and staff were given user accounts and guest accounts were readily available for visitors. 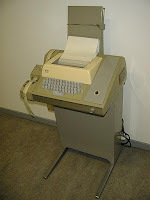 Old mechanical terminals that ran at 10 characters per second were used to interact with the machine, but most of them were in private offices or clusters that weren't open to the public. The computer center did have what was called the "Public Teletype Room" that had 20 or so terminals and a student available to answer questions in person or by phone. If you were into computing, this was a great job. It was low pressure, you had access to computers and you got to help people with their problems. The only job better than this was being a systems programmer (sysprog), those guys who got to write parts of the operating system. This later job was the highest paid job on campus but if you stopped working after10 hours a week you were paid for. Given the excitement of doing real work, it was hard to only work for 10 hours and some students' grades suffered. But the Public Room Assistant job was great and gave plenty of time for working on personal projects. Many kinds of people used the public area. High school students and even elementary school kids were in there either doing serious work, or just playing computer games. College students had priority, but there were often free terminals and the townspeople used them a lot. Like the town library, kids would go there after school and wait until their parents picked them up after work. It was a safe environment for kids, and with any luck the kids would get the computer bug. One of the most basic problems people had was how to turn on the computer and type some simple commands. So, they might have wanted to play tic-tac-toe, but they didn't know how to sign-in and specify the program to run. After all, these people were not computer science students; they were just trying to use the computer and shouldn't be expected to learn or remember such arcania. Each terminal had a cheat sheet, (what we would call now an FAQ) taped next to the terminal which explained where the power switch was, what a user account was and a few simple commands with examples. This was a time-sharing system, so any additional user would slow down other user's programs. Most of the games and other programs didn't requirement many resources, but it could be annoying if you had real work to do and a casual user was playing a game or sending email. So one of the assistants came up with a plan. He developed a cheat sheet that looked similar to the official one. But on page two, he wrote about the fact that the computer had two CPUs and then mentioned that one was better than the other. He then said that the user could select which CPU was to be used. This was a complete lie, but not harmful. But then he went on to say that during heavy loads, the user should select this CPU by typing the command "GOOD" he followed this with the observation that during these times the computer may sign them off because the machine is too busy and they should wait and come back later during non-peak load times. The "GOOD" command didn't exist, but the command line interpreter would parse the first three letters and that would match with the "GOODBYE" command. Needless to say, this command would sign the user out. Now remember, to the user, this was explained, so he never thought he had done anything wrong. This was just a clever denial of service attack which would only work on the casual user who went to the trouble of actually reading the documentation. It was several months before someone in power discovered this bit of fakery. It makes sense to allow abbreviations like "GOO" for the longer "GOODBYE", but it causes problems when a parser allows matches that are not close. Early language compilers typically ignored characters in an identifier after a certain length. For example, FORTRAN may ignore characters after 6 or 8 characters and BASIC would only scan the first three letters of a statement allowing RESET or RESTORE to mean the same thing. While allowing statements to have different spellings may only cause problems when porting programs to another machine, ignoring identifier differences can lead to immediate bugs which may be hard to see. hahaha. I was in high school in New Hampshire in 1967 and we had a terminal hooked up to Dartmouth via time-sharing. Learned to program via mimeographed copies of the still-in-development Kemeney/Kurtz BASIC book. This triggers lovely memories. At just about any time of the workday, DTSS could crash due to the consultant on duty entering the wrong command on a privileged terminal. The consultant acquired privilege for his terminal by calling the operator. Otherwise, the consultant would have had to go into the computer room. Unfortunately, there was no timeout mechanism, so if a consultant neglected to logoff from the privileged terminal, but later started a line with the letters 'SHU' (short for shutdown), the system did shutdown. I have no idea why dangerous commands appeared so often, but at least once a year, and at times once a week, a consultant caused a brief outage. That earned each of them the blue noodle award.